Shirts With Random Triangles: Washington State College GameDay Flag Missing, Could Miss Saturday's Broadcast From Tucson. 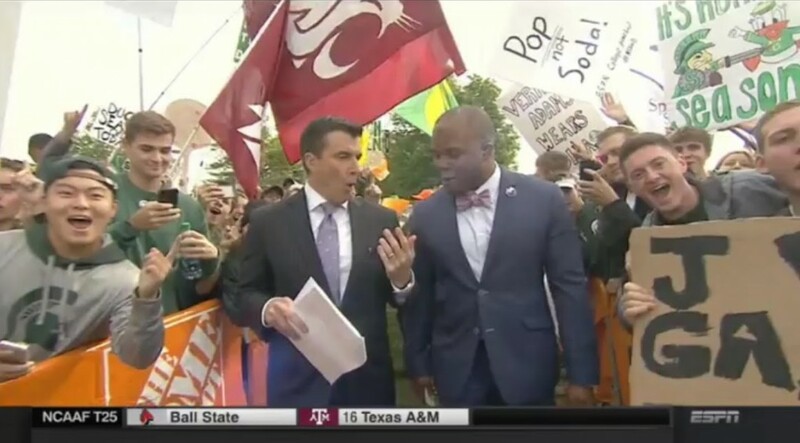 Washington State College GameDay Flag Missing, Could Miss Saturday's Broadcast From Tucson. Ol' Crimson on ESPN College GameDay Sept. 13 broadcast. Image via olcrimson.org. Ruh-Roh! The Washington State flag that has shown up on every edition of ESPN College GaneDay since October of 2003 may not wave on the tomorrow morning on the University of Arizona campus. "Ol Crimson," as the flag is nicknamed, along with its companion grey Wazzou flag have reportedly been lost in transit between the last GameDay stop in Tuscaloosa, Al., and the Saturday's broadcast location in Tucson, Az., for the UCLA-Arizona game. According to Ol' Crimson club coordinator C.J. McCoy The flags' last reported location was somewhere in Mississippi. The Washington St. booster club is responsible for keeping the flags waving during the GameDay broadcasts, and its flags are the ones the ones that are counted in keeping the streak alive. ESPN is reportedly shipping a Wazzou flag that was on display in the its Bristol campus café to Tuscon via UPS express critical shipment. The Ol' Crimson club had presented that flag to the WWL after it decided to honor the school's tradition. It's still not know if it will arrive in time. Concerned Wazzou supporters have taken to Twiiter using the #FindOlCrimson hashtag. The origin of Ol' Crimson's streak dates back to October 4, 2003, when a Tom Pounds, a Washington St. alum living in Albuquerque, NM drove 600 miles to Austin Texas to fly a handmade Wazzou flag when GameDay broadcast from the location of the Kansas State-Texas game . The flag's official website marks the streak's official beginning as October 18, 2003, when GameDay broadcast from Madison, Wisconsin for the Purdue-Wisconsin game. Pounds late wife Syndie, made the first Ol' Crimson GameDay flag. Pounds has handmade subsequent 'Ol Crimson flags.